Caillou™ is an award-winning television series about an inquisitive four year old whose world is filled with fun, learning & imagination and inspires generations of pre-school children to grow emotionally as they explore the world around them. Caillou Mini Backpack: The Caillou Mini Backpack includes 5 mini figures of the main characters: Caillou, Rosie, Leo, Sarah and Clementine. Perfect for your Caillou fan to take along wherever they travel! Caillou Buildable House: Create fun stories in the Caillou Buildable House! 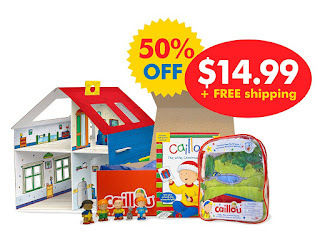 Parents can assemble the cardboard house and then it's time to play with Caillou and his friends. Mini figures will fit perfectly, and stickers are included for hours of imaginative fun! Caillou Activity Book: Filled with seasonal illustrations showing the magic of the holidays, this festive coloring and activity book allows children to make presents for Christmas, just like grown-ups! The Caillou Holiday Box is delivered in an outer cardboard box. There are only 1000 of these Caillou Holiday Toy Boxes made, so when we sell out, that is it for this year! This product is only available in the US and Canada. The Limited Edition Caillou Holiday Toy Box is awesome! My 4 year old absolutely loves Caillou so when she saw this Limited Edition Caillou Holiday Toy Box she was in beyond thrilled. The Limited Edition Caillou Holiday Toy Box comes with a Caillou Mini Backpack that includes 5 mini figures of the main characters: Caillou, Rosie, Leo, Sarah and Clementine. It also comes with a Caillou Buildable House and Caillou Activity Book. The house was extremely fun to build! My daughter loves playing with her Caillou mini figures inside the house. She also loves that she can pack them up in the backpack and take with her on the go. The Caillou Activity Book is super fun and filled with some serious Caillou fun! This Limited Edition Caillou Holiday Toy Box would make absolutely incredible gift this holiday season for any preschooler!